The Protect Life: Northern Ireland Suicide Prevention Strategy highlights the important role of community-led suicide prevention and bereavement support services. The refreshed strategy highlighted the main findings and recommendations of the Churches Research Programme (2009). This research explored the problems and barriers faced by clergy in the delivery of pastoral care to families bereaved by suicide. Clergy feel that tackling suicide is a major issue and feel that faith based organisations should be involved in tackling it. Clergy generally lack any training as part of ministry for dealing with mental illness and suicide and have little awareness of advice and support services for mental health problems experienced by congregation members and others. 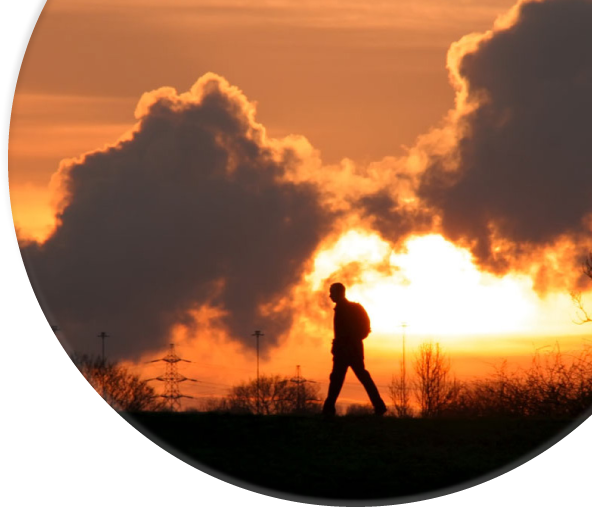 They indicated that they would benefit by attending training on mental illness and suicide but are concerned about peer-perceptions of inadequacy, perceived hostility from secular organisations and lack of time for these activities. Theological perspectives on suicide and the sanctity of life, while still crucially important to clergy, are not a deterrent to offering compassionate pastoral care. Clergy are often unsure about how to approach a family following suicide. The importance of careful and sensitive choice of language was stressed; the fear of upsetting or offending families through a misjudged remark is particularly worrying. Most clergy feel that the best response they can offer to families is ‘to be there’ and offer a ‘passive’ response. Although religion and spirituality can be comforting, a religion-couched message to families bereaved through suicide was regarded as sometimes unwanted and unhelpful. An inter-faith dialogue and response to dialogue is both desirable and possible. Much interfaith connection currently exists and was thought useful but for some clergy there must be recognition that the beliefs and value systems within different faith groups preclude a straightforward, homogenous response to suicide. Faith based organisations need to recognise the huge demands on their clergy in their pastoral care, from dealing with emotional distress through mental health problems to bereavement by suicide. Stress awareness and management would be a useful part of training for ministry. Clergy would appreciate clear, formal guidelines on the pastoral approach to suicide which would include all problematic areas for clergy – everything from how to respond to that first phone call to how to conduct a funeral in such circumstances and almost anything that would give them direction beyond common sense approaches upon which they usually rely. Clergy could be better supported throughout the years of their ministry by creating formal structures of peer-support (pastor pastorum). Some clergy may benefit from professional counselling support particularly following suicide by a member of the congregation. Clergy should be provided with education and awareness-raising regarding mental health problems, symptom recognition and the appropriate response and referral as part of the theological college curriculum. Health and social care agencies should recognise the pivotal community role of clergy. There is an urgent need for dialogue between clergy and mental health professionals. The provision of seminars and workshops that would be of greatest benefit to clergy would cover a complete programme on suicide awareness and bereavement by suicide. A set of guidelines for clergy on how to respond to people bereaved through suicide need to be drawn up collaboratively. In the context of this research and the Protect Life Strategy and as a result of the experiences of Lighthouse, the Churches’ Community Work Alliance NI and a group of clergy (who have been active on the issue of suicide) a series of informal discussions began in 2011. In February 2012, the group began to meet together to explore ideas for a joint churches’ initiative on suicide. 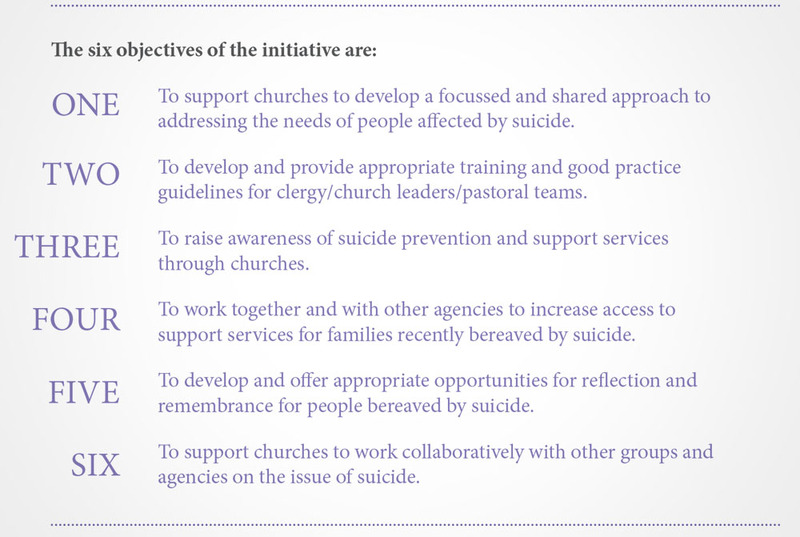 The working group identified five main areas where the churches could potentially work together and in collaboration with other groups and agencies, to address the needs of people affected by suicide. Developing and providing a training pathway for clergy/church leaders. Introducing a Church Sunday to raise awareness of suicide. The Working Group facilitated focus groups with leaders from a cross section of churches and faith based organisations, and a cross section of community based mental health groups to consult on the initiative. Feedback from each of these consultations was incorporated into the initiative. The development of these guidelines and a Training Directory marks the first phase of the initiative. The overall aim of the initiative is to support churches in addressing the needs of vulnerable people and those bereaved by suicide. The overall aim of the initiative is to support churches in addressing the needs of people affected by suicide.